Over the past 3+ years, I’ve shared a number of DIY cleaning products here on the blog. 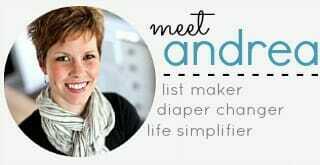 I will be very honest with you, the main reason I make many of my own cleaning products is because they are SO much faster, cheaper, and easier than buying them from the store. Yes, it’s nice that they are safer around my kids and kinder to the environment too — but my main goal here is fast, cheap, and easy. I almost always have the simple ingredients in my house, so I can always whip up another batch in a minute or so. This means I never need to run to the store for more products and I don’t have to spend a fortune on store-bought chemicals. Plus an all-purpose vinegar-based cleaner that works on just about everything. Along with everything listed out above, I’ve tried many other DIY cleaner recipes that I have NOT posted on my blog because in my opinion, they either didn’t work well enough, they were too time consuming or complicated to make, or they really didn’t save any money over store-bought products. Some of those “tried but never shared” recipes were DIY laundry detergent. I’ve tried a few different laundry detergent recipes over the years but literally hated them all — and I’m really not one to care that much about my laundry. As long as my laundry is clean, relatively wrinkle-free, and smells nice, I just don’t care. However with all the DIY detergent recipes I’ve tried in the past, I ended up with clothes that didn’t seem clean enough for me, and they certainly didn’t smell nice. Plus, the recipes usually involved boiling bars of soap (which I had no desire to do) and storing mass amounts of goopy liquid in my TINY laundry room. After a few failed attempts, I simply decided that homemade laundry detergent was not for me; and I gave up searching for new recipes. Then, a few months ago, I found a recipe for a DIY powder detergent that didn’t involve any boiling. It didn’t require expensive or hard-to-find ingredients, and basically only involved dumping a few boxes into a large bucket and shaking it. If that doesn’t sound good enough already, this recipe is WAY more than “just” laundry detergent. It’s also spot treatment, whitener, brightener, deodorizer, and fabric softener all in one. You can use this detergent for front or top-loading machines and it’s safe for high efficiency machines too. Oh, and one batch makes a lot of detergent so you could easily share with friends or even give it as a gift in a pretty container. Makes enough for approximately 230 loads of laundry! If you have a very large or heavily soiled load, maybe use 3 or 4 Tablespoons. NOTE: You can use the scoop from the OxiClean or the cap of the Purex to measure out the proper amount. The OxiClean scoop is exactly 2 T. and the Purex “fill line” is also 2 T.
We’ve been using this detergent for a couple months now and I honestly have nothing bad to say about it. I’m happy to say that this recipe meets all my requirements! I have not noticed any difference in the cleanliness of our clothing. The OxiClean takes care of any stains (which eliminates the need to spot treat) and the Purex Crystals make the clothes smell amazing. You could definitely make this without the Purex Crystals and just use regular fabric softener or drier sheets if you’d like. Or you could try any of these handy tips to reduce static cling. Just dump, grate, and shake. To be honest, I was a little disappointed that this recipe required grating 3 bars of soap. I tried to see if I could find something that worked without grating — but this recipe really is the best. It probably took me about 15 minutes to grate all 3 bars, but that was doing it all by hand. I didn’t want to put the soap in my food processor, but if you did that, it would only take about a minute! Based on how much detergent this one batch makes, I personally feel it was worth the 15 minutes of grating — especially since the rest of the “mixing instructions” only took about 3 extra minutes. 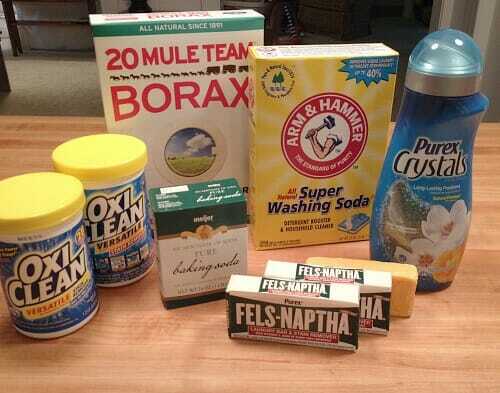 When I made this recipe, I had most of the ingredients in the house already (everything but the Purex Crystals and 1 bar of Fels-Naptha soap)… however, I price-checked everything at the store and even WITHOUT coupons or sales, it should cost you less than $25 to make this massive batch of detergent. If you purchased any of the items on sale and/or used a few coupons, it would probably be closer to $15 or less — and I’m guessing many of you have some of these ingredients in the house already! I did the math and even without coupons or sales, this detergent would be right around $0.09 per load!! I think it’s still a lot more “natural” than regular store-bought laundry detergents — with the added bonuses of my beloved OxiClean to fight stains and Purex Crystals to act as fabric softener and give a fabulous smell. I’m super happy with this DIY laundry detergent and I’d highly recommend giving it a try — especially if you’ve been disappointed by other DIY detergents in the past. 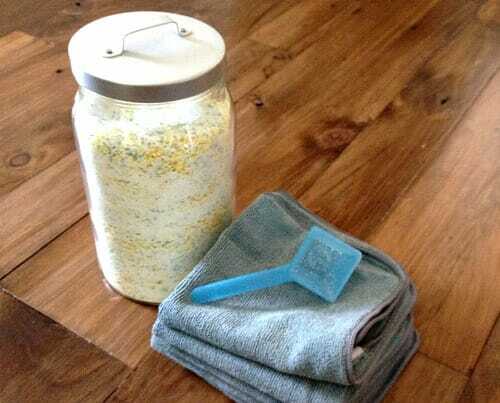 I’m curious if you are still using this homemade laundry soap, and if you use it on infant clothes. Thanks! I was also curious about the same! I’ve always used it on Infants clothing — and I do still use it regularly now. I dont’ use it for white though because I bleach those and you’re not supposed to mix bleach and oxyclean! sorry, never got back to you — I have always used this in infants clothing — but you know me, I never sort, so I’ve never washed infant clothing separately or with separate detergent! In making our latest batch of this laundry detergent, my husband came across a tip that I just HAD to share with you! He found that if you cut the Fels Naptha into a few chunks and microwave it for two minutes (one bar at a time), they will interestingly puff up into something resembling dinner rolls. After letting the soap dinner rolls cool for a couple of minutes, toss them into a Ziploc bag and crumble! 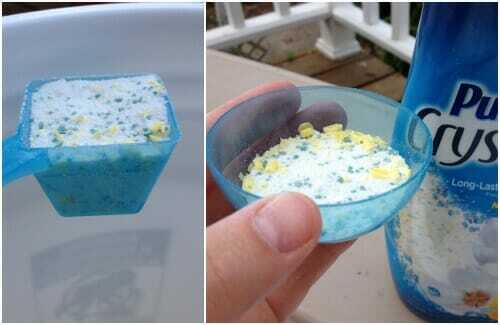 Effortless teeny soap crumbs. No more grating. Yay! yes, I’ve been told this before — such a great tip! Thanks for sharing! A few days ago I realized that I haven’t had a single asthma attack in the several years I’ve been using this detergent. 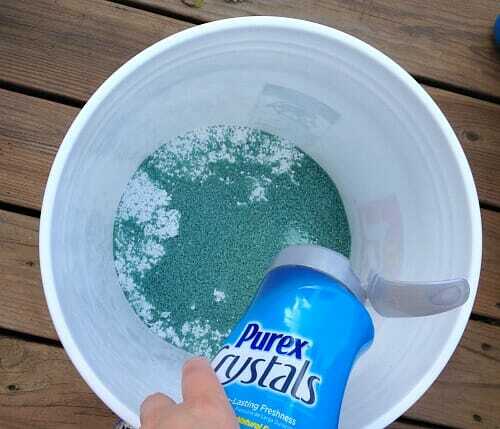 I don’t use the Purex Chrystals. I either use vinegar or Downey free and clear. In the winter I use dryer sheets unscented. I’ve determined that the scents in laundry products makes me ill.
wow — this is so encouraging to hear! Stay away from those fragrances I guess! I tried this recipe not long after this post was published. The detergent does work though some stubborn stains (grass and mud, mostly) needed extra TLC. However, I did have one problem. The Fels-Naptha wouldn’t always dissolve. I’d find it on clothes after they’d come out of the wash. It washes out by hand just fine but….I’d rather not do that. Any ideas on an alternative to Fels that would work? Or would the detergent recipe work without it? Courtney, are you using hot (or at least warm) water? I always use hot or warm and that helps the Fels Naptha soap to dissolve. If you’re using cold water, that’s most likely the issue. Also, you could try grating it into smaller pieces. I grate mine pretty small and have never noticed any residue. Do you know if you can use with a he front load washer? That is a amazing that the cost is only 9cents a load. 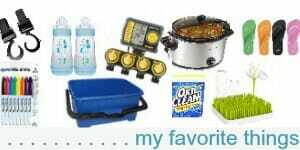 Hi – I just came across this post as I am looking for a chemical free laundry detergent. 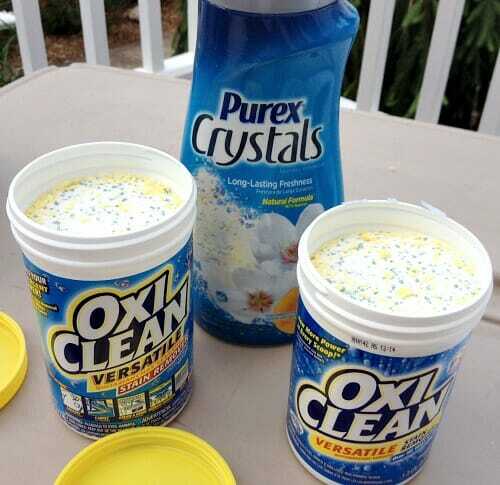 The oxygen clean and Purex is full of chemicals, do you know of anything to replace the oxy clean that would work well? There is a product that works like Oxyclean, but is a lot more environmentally friendly. It is made by Branch Basics, a company that makes a concentrated cleaning solution that you mix with water that is safe for so many uses, and it does not smell (which is why I use it – I can’t even stand the smell of vinegar or bleach – or even Fels Naptha for that matter). They make a product to use instead of Oxyclean called Oxygen Boost. It is also concentrated, so you’d have to figure out how much of it to use compared to the Oxyclean. The scoop that comes with the Oxygen Boost is much less than the big scoop that comes with Oxyclean. 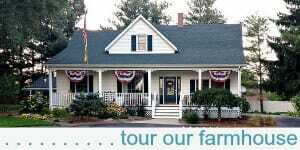 Go to http://www.branchbasics.com to see what all they carry. It is a bit pricey, but I LOVE their products! I use the food processor to grate the soap. Clean it with vinegar afterward, soap is a base and vinegar an acid so it neutralizes it. I learned this after many pesky cleaning sessions after making the cooked versions of laundry soap. It is amazingly easy! Thanks for the tip Tonya! Just for kicks, I wonder if exchanging the Purex for white vinegar in the rinse cycle would work. It would “green” up your laundry too. For a nice smell, I just put a damp cloth in the dryer w/essential oil or a rub a bit of non-toxic conditioner. yup, you could totally do that. Vinegar works the same as any fabric softener — it would just be one extra step and you wouldn’t get the smell. But if you don’t care about that, them I’m positive it would work just fine. The Purex is totally optional, just for smell. I never use it because I want my clothes to smell like nothing. 🙂 (and fabric softener is not good for your dryer) Also, a crank handle cheese grater works well, just cut the bar of soap into three pieces. I have made it using a bag of tiny hotel soaps, worked perfectly. Or you can use Ivory soap, put it in the microwave for about a minute and it turns into a large weird blob which you can then just crush with your hands and it turns into powder….strange stuff but the kids like doing it! And I only use hot water on whites, so yes, it does work just fine with cold water! Where did you purchase the Fel Naptha Soap? I have never seen this before and was wondering where I should look to purchase locally or should I purchase online? Is this recipe safe for your septic? I have heard of other homemade detergent recipes that are not safe for the septic system and want to be sure this one is okay before I make it. 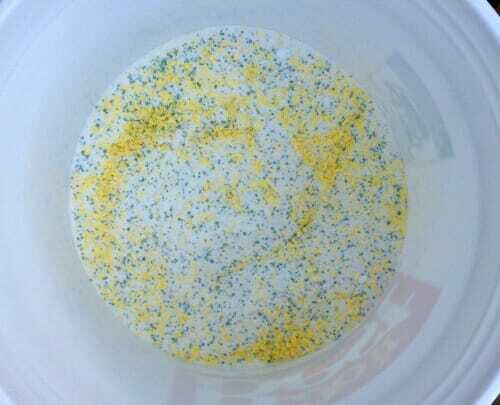 How large of a container did the detergent make? it makes a lot — I mixed it up in a 5 gallon bucket and it was about 1/2 full. 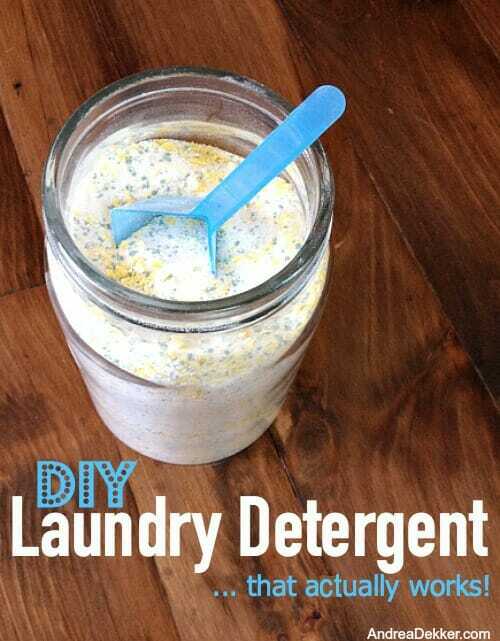 This is the first diy detergent that I have actually wanted to try and make. Thanks for the great directions, I can’t wait to make it! haha — probably because it’s only of the only recipes (at least that I’ve seen) that is relatively simple with easy-to-find ingredients. Plus, I’m not making any detergent that requires boiling on the stove! Hope you like it! I’m wanting to find a recipe for homemade laundry soap to use but be safe for an infants clothing. would this be safe to you, or you think not? Well, I don’t think I want to be the judge of if it’s safe or not — but I use it for ALL our laundry, including both kids. I’ve been using it since Simon was born and it’s never affect him. 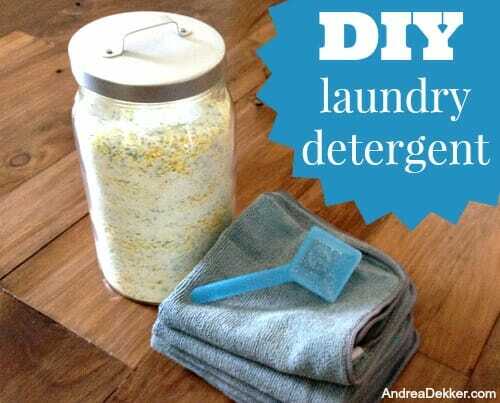 I read this blog over the summer and as I am finally running low on my own laundry detergent I was thinking about making this. Do you still use it and like it as much as you did when you wrote this post? yup, still using it every time I do laundry — and I’m STILL using the same batch I was on this summer when I wrote the post! I’m nearing the bottom of the bucket (1st batch)…LOVE this! Our clothes smell SO much better than with the liquid detergent and softener we were using. I’ve also replaced fabric softener with vinegar and am so happy with the results! Thank you for sharing this. yay, thanks for sharing Sarah!! glad you’re loving it!! Just a note that we also added epsom salts to this recipe and the clothes come out so so soft! thanks for letting me know! That’s an interesting idea that I’ll need to look into! Gloria – how much Epson Salts did you add to this recipe? I added a one pound bag that I bought. the whole bag.